Imagine your Uber rolling up in a polka-dotted Traverse! At the Walt Disney World Resort in Orlando, Florida, there are plenty of ways to get around. You can climb aboard a bus, board a ferry, or take a ride on the monorail (¡Por favor manténgase alejado de las puertas!). Even with all of these options to choose from, Disney World is constantly adding new means of transportation. At the D23 Expo this past weekend, Disney revealed two additional transport systems: a fleet of Minnie Mouse-themed vehicles and an extensive gondola network. 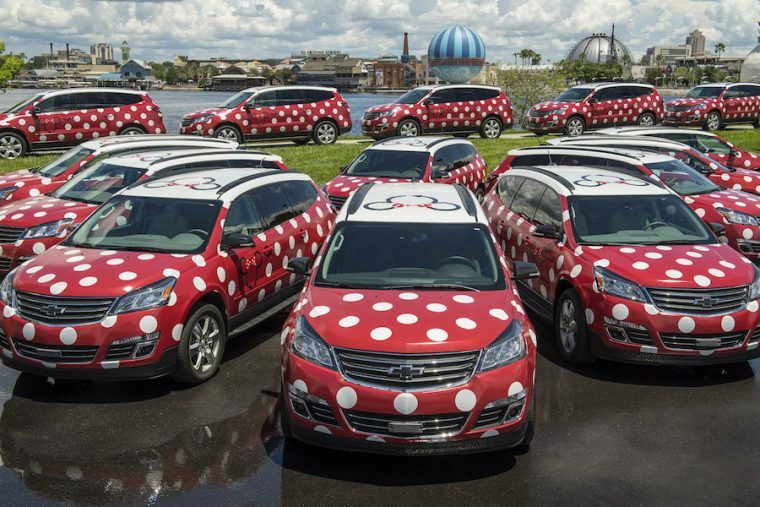 During the Disney-oriented expo, Disney unveiled a fleet of red Chevy Traverse vehicles that were lined with white polka dots. While these vehicles aren’t quite “Minnie-Vans” as many have dubbed them, they still have room for up to eight passengers. The vehicles will transport guests anywhere they want to go (more specifically anywhere they are allowed to go) throughout the Walt Disney World Resort for a rumored flat rate of $20. This transportation system will be Disney’s answer to Uber, an attempt to diminish the presence of outside ride-sharing programs on site while attempting to profit from the phenomenon. “Since we’re all about exceeding guest expectations and making every aspect of your vacation uniquely Disney, we’re creating a new point-to-point transportation service in a way that only Disney can do,” explained Bob Chapek, the chairman of Walt Disney Parks and Resorts. The fleet is set to launch at Disney’s Boardwalk and Yacht Club Resorts later this month. From there, the service will spread to other Walt Disney World resorts. 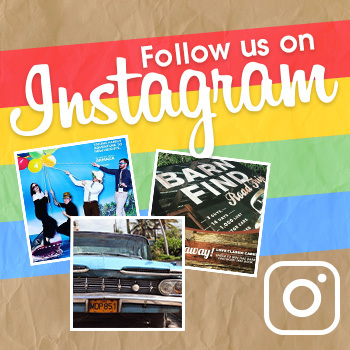 A ride-share fleet of vehicles is an expected form of transportation given recent trends. What is far more unexpected is an extensive network of gondolas. 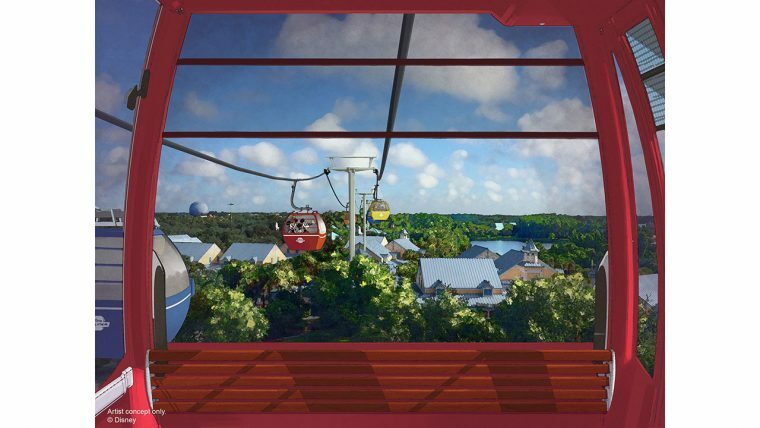 Dubbed the “Disney Skyliner,” this system of gondola vehicles is set to transport guests from Epcot to Disney’s Hollywood Studios. Along the way, the gondolas will make stops at Disney’s Art of Animation, Pop Century, and Caribbean Beach resorts. 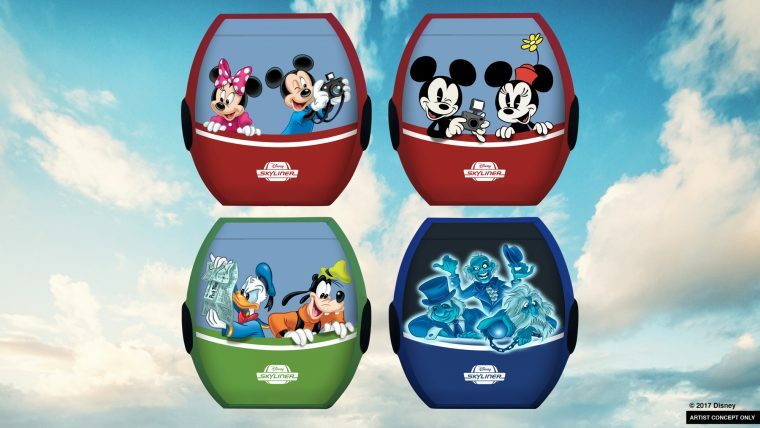 To effectively put a Disney spin on each airborne gondola, art featuring famous Disney characters will be added to the vehicles. Concept sketches show Mickey and his pals, along with some Hitchhiking Ghosts from the Haunted Mansion attraction. As adding a gondola network can be a pretty extensive undertaking, there’s currently no concrete timeline for when it will open. Still, it seems likely that these skybuckets will be fully operational by the time that the Star Wars: Galaxy’s Edge area of Disney’s Hollywood Studios opens in 2019.